Provide comfort for the family of Sandra Wiederstein with a meaningful gesture of sympathy. 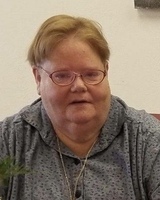 Sandra Gail Wiederstein was called to be with the Lord on Friday, March 15, 2019. She was surrounded by family and friends. Born to Merle and Leona (Waymire) Wiederstein on November 10, 1959 in Garden City. She graduated from Garden City High School in 1977 and later earned a B.S. from Ft. Hays State University. She lived in Garden City her whole life. She worked 41 years caring for adults with special needs in Southwest Kansas. 15 years ago, she co-founded Karis with the dream of creating compassionate care for those she cared so deeply about. Sandra was a member of New Life Community Church, Girl Scouts of America, and the American Red Cross. She survived cancer. There wasn’t a person or animal in need that Sandra wouldn’t help. She loved camping, hot air balloon rides, boating, and traveling. She had spontaneity down to a science. Sandra touched so many hearts and lives during her time here. What a blessing from God. Sandra is preceded in death by her grandparents Myron & Pauline Waymire and Harry and Helen Wiederstein, and her father Merle in 2015. She is survived by her mother Leona, aunts, cousins, friends, co-workers, and God children. A Celebration of Sandra’s life will be held at 2:00 p.m. on Wednesday, March 20, 2019 at the First Assembly of God in Garden City with Pastor Jeff Mitchell officiating. Burial will follow at Valley View Cemetery in Garden City. There will be no calling hours. Memorials may be made to New Life Community Church, St. Jude’s Children’s Research Hospital, Compassion International, or the Finney County Humane Society all in care of Garnand Funeral Home of Garden City. To plant a memorial tree in honor of Sandra Gail Wiederstein, please visit our Heartfelt Sympathies Store. I have many great memories about Sandra. We worked together at SDSI for 7 years. We both worked our way up to Case Managers together. When she started staying in Liberal part time she rented our basement. We loved playing practical jokes. we placed a for sale sign in our directors yard, toilet papered offices, filled cars with styrofoam, and many more fun jokes. I am sure Jesus met her at heavens gate and stated "Well done Sandra, my good and faithful daughter!"